Best Days: Tues: large swell though very windy: not confident on there being great waves though, conditions look tricky. Wed: smaller but much cleaner. Fri: nice arvo pulse of new swell, holding Sat with good winds. Mon: large swell with gusty SW winds. Recap: We’ve seen some incredible readings at the Cape Sorell buoy today. Significant wave heights averaged 6m for much of the day (max heights of 12m) but late afternoon, it jumped considerably with Hsig reaching 8.2m and Hmax peaking at 16.5m (54ft). This is the byproduct of a deep low that’s traversed the Southern Ocean for a few days but underwent a late intensification just SW of Tasmania this afternoon. Most of today's initial increase was NW windswell - aimed well and truly away from Southern Tasmanian coasts - but now that the low is passing below the state, we’ll start to see new short range groundswell fill into the region. As a side note, Maatsuyker Island recorded some incredible wind gusts today, with average wind speeds of 75kts and peak gusts of 86kts. Other notable wind gust readings include Cape Bruny (69kts), Low Rocky Point (65kts), kunanyi / Mount Wellington (63kts), Cape Grim (58kts), Low head (56kts), Cape Sorell (55kts), Flinders Island (54kts), Eddystone Point (54kts) and Maria Island (53kts). By and large, this weather progression has so far been aimed out of the South Arm’s swell window - up until this afternoon. The storm track’s been a little too north, so the resulting swell direction to date has been quite west, or even north-west across Tasmanian latitudes. Essentially, this means that we can largely discount much of the Cape Sorell data (as a proxy for potential surf size across the South Arm) because it’s all heading in the wrong direction. Sure, the low is now entering our swell window but the fetch length from this development is comparatively short, and it’s also travelling at a reasonable speed to the east - so we have to be cautious as to how this will translate to surf size. That being said, core winds developing inside our swell window are above 50kts and this will generate a very large event that will peak in the early hours of Tuesday morning. The negatives for Tuesday - as a surf day - are gale to storm force W/NW tending W’ly then W/SW winds, and also a continuing strong W’ly component in the swell. Exposed beaches should see a peak up into the 5-6ft+ range but the westerly direction will create much smaller waves at protected locations. Of course, locations facing straight west will be much, much bigger though very wind affected. The flip side is that many sheltered spots won’t necessarily enjoy the early W/NW component in the wind direction. We’re not expecting true SW winds to develop at all, so bear in mind the blustery wind conditions when choosing somewhere to surf. Wave heights will ease rapidly into Wednesday, from 4ft+ to 2-3ft at open beaches. Winds will also relax considerably and should swing moderate W/NW into the morning, then light NW through the rest of the day. This would be a better day to consider looking for waves across the South Arm, despite the easing trend. Much smaller surf will settle in on Thursday, with light variable winds keeping conditions clean. An approaching front on Friday will swing the wind around to the west - though without any major strength - and also deliver a slow building SW swell from its incarnation through the swell window earlier in the week. This system looks reasonably good (though not perfectly aligned for Southern Tasmania), and we should see the South Arm rebuilding from 1-2ft up to 3ft+ throughout the day. There should be some fun waves to finish off the working week. Friday’s late increase in swell is expected to hold into Saturday morning (3ft+), before easing a little through the afternoon and into Sunday (2ft). A series of powerful fronts approaching from the SW will steer the winds around to to the NW, and it’ll become quite strong at times on Sunday from the W/NW - but Saturday should see light offshore breezes and a little more size than Sunday, so make that your preference. 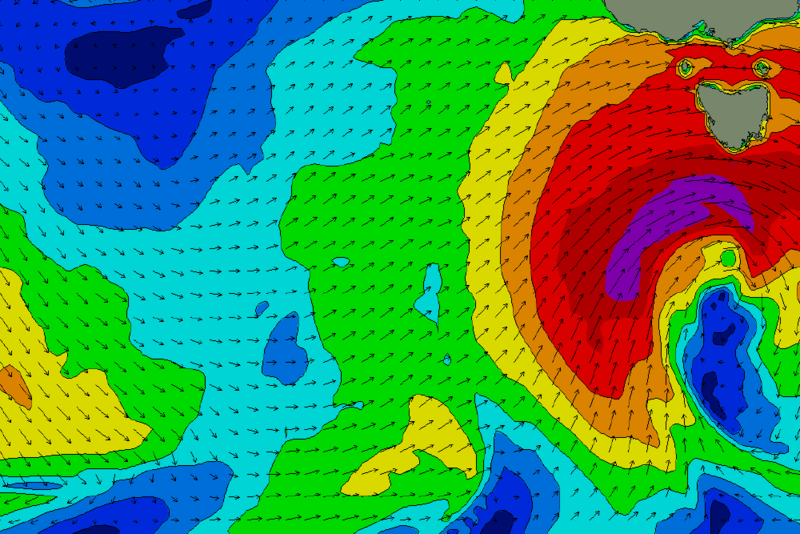 We’ve got another very large swell due early next week. And in contrast to the current swell event - sourced from a powerful low, positioned relatively close to the coast - next week’s waves will be sourced from a polar low developing SE from Heard Island (off the Ice Shelf) later Thursday and Friday, before it tracks NE towards the state over the weekend. Because the bulk swell production will develop much further from the mainland the groundswell quality should be better. The only downer is that winds will likely be gusty onshore associated with the passage of a cold front, but I like this storm track and the associated swell direction a lot better for the protected South Arm locations. So, it’s worth pencilling in Monday for a paddle. More on this in Wednesday’s update. Part of the problem for tomorrow on the South Arm: insane fetch (50kts+, chart is 10pm this evening) aimed into the coast, but still a lot of west in the direction. And not enough travel distance for the wavelength to draw out, and allow for proper diffraction. Exactly what we are seeing right now. Hi mate, Craig is back on deck so they'll be updated in the next hour or so. Thanks for your patience.